Let me start by saying this is a GORGEOUS and substantial book. 512 pages! 650 color photographs! 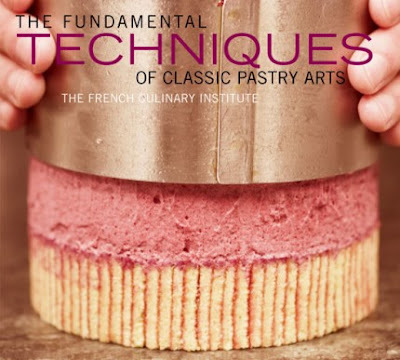 The book is based on the pastry arts curriculum at New York’s French Culinary Institute's --a curriculum developed by master pâtissier Jacques Torres. There are chapters focused on each of the classic categories of confection: tarts, cream puffs, puff pastry, creams and custards, breads and pastries, cakes, and petits fours. It's like culinary school in book form. If you're a budding baker, you'll want this as a learning tool. If you're an experienced baker, you'll want this for a reference. I've already used my copy a couple times and it's saved me from screwing up several batches of caramel. The book retails for $75, but we're giving one away for free. Here's how it's going to work... I've tweeted the link to this post. To enter, retweet the link to your followers and post a comment here with the link to your tweet. You can enter as many times as you'd like, but you have to post a separate comment and separate link for each entry. Next Thursday we'll randomly choose the winner and the friendly folks at Abrams will ship a copy to you (we have to limit this to the 50 states, sorry international readers!). To whet your appetite for this book, take a peek at Abrams' site. 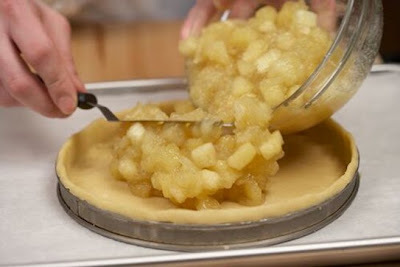 Where you can download the recipe for Tarte aux Pommes, the same delicious tart in the photo below, used with FCI and Abrams' permission. Or you can check out their recipe for eclairs here. But come on, you know you want the book, so get tweeting! Oooh, looks very pretty, I've just been considering plated pretty desserts, a perfect addition to my collection. I tweeted @jennywennycakes! The book sounds fantastic! Thanks for having this giveaway! I love baking and so look forward to trying out the creations in the this book! Thanks for the contest! This book has verified the existence of love at first sight! this books looks fantastic! a friend mentioned this blog to me back in august, and i've been reading every post since - it's amazing! Ahhh, more sweets..just what I need in my life! Oooh! This book looks marvelous! Would love to learn some professional techniques and excellent recipes! I so hope I win this book! I love this stuff and want to hone my baking skills! Hoping to win this wonderful book! (^___^) I so want this book!! OOOOOh I want this book! I'd love to build up my baking skills, and also my cookbook collection! Thanks! Here's to a last minute entry! When trying to get the link to my tweet it sent me back to your original tweet. Shows I am listed though as retweeting!